The fourth nuclear power plant is an assembled plant… The Taiwan Power Company designed the plant itself and contracted out. When it purchased the parts in Taiwan, it usually chose the cheapest ones…Because these parts were purchased at different times and have different levels of quality, the proceedings of construction was a mess…Now test runs have begun, but we see problems like the cancelation of contracts with the original consulting company and General Electric. Therefore, we no longer have experienced consultants and supervision for this plant. 我做工業設計的, 各個製造商像日立東芝三菱富士設計圖的小數點進位規格不同是確實的. 而那0.5mm的差別作機構的最清楚. 可以想像核電廠由那麼多上下游工廠出品的組件零件建構在一起, 其中的誤差所造成的後果可不是手機造壞了再造一台那麼簡單! I am an industrial designer. It is true that producers like Hitachi, Toshiba, Mitsubishi, and Fuji have different rules for decimal point carrying on blueprints. The person who is responsible for machinery structure is very clear about the 0.5 mm difference (among the parts produced by different companies). We can imagine that if a nuclear power plant is assembled using numerous parts generated by many companies, the result of these kinds of errors are not as simple as errors in making cell phones, in which case we can make another cell phone easily. Despite these safety concerns, Taiwan’s president Ma Ying-jeou has said that [zh] the government has dismissed calls by opposition lawmakers to halt the project, scheduled to go into operation in 2012. The government does not value these professional opinions. On the contrary, they consider these professional opinions as ‘some people’s doubts’ that should be ignored if they can't be clarified. The fourth nuclear power plant under construction. Photo courtesy of Muhchyng under a Creative Commons Attribution 2.0 Generic license. How can the drastic measures mentioned by the Taiwan Power Company and the Atomic Energy Council give priority to our citizens? To be straightforward, they will plan an evacuation area for a radius of 5 km (or as far as 10 km). Yet, they never rehears how people in this area are to be evacuated. If a situation does develop and we need an evacuation area with a radius of 20 km, the evacuation area would include Taipei city. If this happens, it is estimated by environmentalists that 1.6 million citizens would take part in the evacuation. If the Taiwan Power Company and the Atomic Energy Council won't consider such a scenario, how can they say they will give priority to our citizens? What the Taiwan Power Company and the Atomic Energy Council mean is that a nuclear power plant accident can only cause temporary damage like an earthquake. Nevertheless, if there is a nuclear power plant accident, the radiation pollution will persist for many years, never mind the spread of radiation dust. 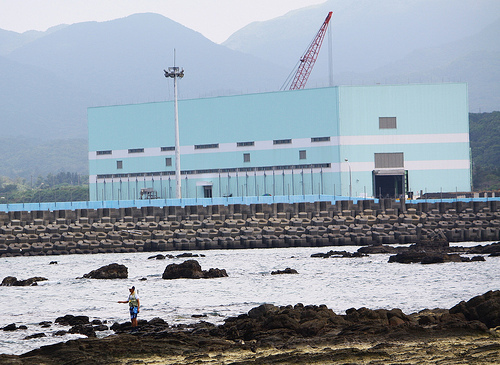 The complacency of the Taiwan Power Company is the most serious crisis for nuclear safety. Among which are calls for the phased abolition of nuclear power in Taiwan – which, assuming an absence of cost-effective alternatives, would necessitate reductions in nationwide power consumption. That would be economically destructive. Actually, I believe Taipei city would fall just outside that 20km radius – as the distance from Gongliao to Taipei city is approximately 27km according to my pocket road map and slide rule. So assuming a 20km radius for evacuation, residents of Taipei city would *not* have to evacuate. The risks here depend on the nature and severity of any event. The radiation from the Fukushima plant has been relatively minimal; mostly short-lived isoptopes disappearing after a few minutes and incapable of being blown by the wind more than a few km. As for “pollution”, effective treatment and management of radioactive waste requires that it be reduced and confined as much as possible in order to mimize the risks of wider pollution. (1) Part of Taipei city is less than 20km away from the first and second nuclear power plants. (2) Today in BBC news, the researchers found the radiation level in the tap water in Tokyo is too high for infants. I do not know how much risk you want to take, but others may consider something like this as risk. For people in Fukushima, the radiation pollution they face will last much longer. Regarding the review for the energy policy, I think any citizen in a democratic country can do it whenever they find it is necessary. It is definitely not decided by you. Granted. My mistake, I had wrongly assumed the comment was in reference to the fourth plant only since your article begins with a focus on that. I would agree that the two aging plants in Taipei County (Xinbei) ought to be closed down; it would be better if they could be replaced with newer, more efficient and safer plants in other locations further away from residential areas but I don’t know whether that would be possible. Interesting that that BBC report fails to mention the actual becquerel value recorded in the water and the difference between that value, and the range of values normally found in Tokyo tap water, though isn’t it? No matter, the value is given here in this report as a concentration of 210 becquerels per litre – this is a trace amount. To add a little more context, the highest reported dose level of radiation at the edge of the 20km evacuation zone (never mind Tokyo) was 0.16 millisievert/hour – which is similar to that of two dental X-rays. Why do you think the BBC report only alarming descriptions of the radiation without any supplementary data and explanation of that data? Of course, and I wouldn’t dream of telling people what risks they may and may not take. Yet these risks are being deliberately presented in exaggerated form by the mainstream press agencies (and other media) and those who stand to benefit from the political destruction of the nuclear power industry by encouraging psychological panic among the public. This is extremely irresponsible. Do you have any actual evidence to support that claim? You call it a “review” of energy policy and I have no argument with a “review” per se. In fact, I am all in favour of further rational criticism and re-think of nuclear plant design. Yet I suspect that what environmentalists really have in mind when they speak of a “review” is an outright demand for abolition of nuclear power in Taiwan. Is that not so I-Fan? Of course not, but it will definitely not decided by you either. And I note that that is the second time you have been rude to me.